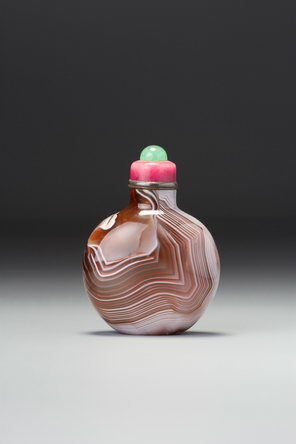 Among the Yangzhou-school overlay snuff bottles that incorporate additional detail in the ground carving, this example represents the highest standard, one that is simply unsurpassed. Not only is it superbly composed and carved, but the balance between contrasting relief and carving in the ground colour is impeccably achieved. The white blooms of three of the chrysanthemum flowers and the hairs of the fly-whisk work brilliantly, despite being similarly placed at the edges of the composition. If we imagine the crackled vase on one side, and the brush-pot, scrolls, and weiqi board on the reverse in coloured relief, these fringe details would fall out of balance, but as it is they serve as perfect emphases to the broader areas of relief carving in white. 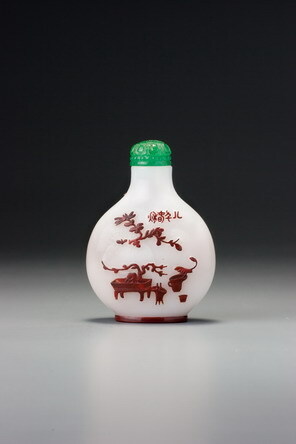 As we might expect, the footrim is as impeccably carved as any from the height of Imperial carving from the Qianlong era, constituting yet another exception for this school, and while the ground plane is unusually well finished and evenly polished, there is a hint of undulation, as there is on any Yangzhou school bottle, however good it may be.